I don’t usually bake on request — I’m just curmudgeonly that way — but there are exceptions to everything. Last weekend I visited North Carolina for a family meeting and was treated to fall leaf color and some wonderful Southern hospitality from my cousin P and her husband J. Grits, creamed home-grown corn, and barbecue complete with Southern-style cole slaw were just a few reasons why my palate was very happy I made that cross-country trip. When P mentioned that they were looking for a good focaccia recipe, I thought it was the least I could do. I think I got the better end of that deal — thank you, thank you! — but the focaccia is still pretty good. 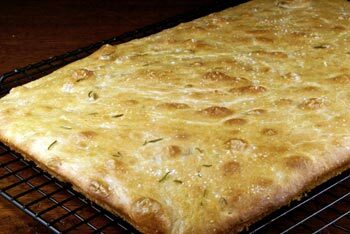 Focaccia can be crisp or soft, plain or topped, or even sweet. 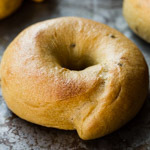 This one is soft, and delicious with a sprinkling of salt and fresh herbs. In the bowl of a stand mixer fitted with a dough hook, combine the flours, yeast, 9 g salt, olive oil, and 350 g of the water. Mix on low speed until the ingredients are incorporated, about 5 minutes. Continue mixing on medium speed to a medium level of gluten development. The dough should hold together around the hook. Add the remaining 50 grams of water and mix until the water is completely incorporated. The dough will be very wet. Transfer the dough to an olive-oiled container. Immediately give the dough a fold (this can be done right in the container). 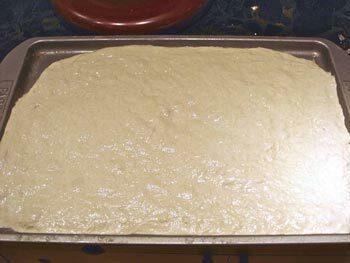 Cover and ferment for one hour, or until the dough is approximately doubled in size, with another fold after the first 30 minutes. Turn the dough into a rimmed 10 x 15-inch sheet pan that has been well oiled with olive oil. 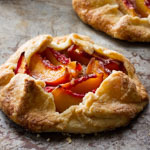 With oiled fingers, gently stretch and press the dough out to the sides of the pan. If the dough resists, go a little bit, let the dough relax for a minute or two, and go a little more. Slip the pan into a large plastic bag and proof at room temperature for 30 minutes. Dimple the dough by pressing into it firmly with oiled fingertips until they feel the pan. Slip the pan back into the plastic bag and proof until approximately doubled in size, about one hour and 15 minutes. Meanwhile, preheat the oven to 400F. 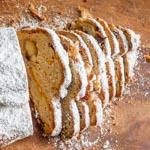 You will need steam during the initial phase of baking, so prepare for this now. 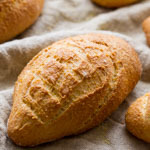 Before baking, brush the dough gently with olive oil, taking care not to degas it. Sprinkle with herbs and coarse salt. 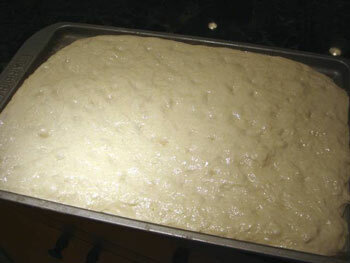 Bake for 8 minutes with steam, and another 17 minutes or so without steam, until the focaccia is golden brown. Remove immediately from the pan, brush again with olive oil, and cool on a wire rack. 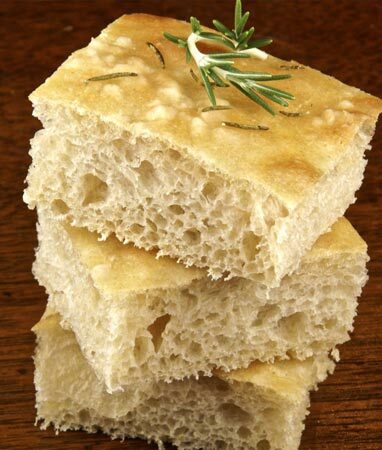 Mmm…I’ve had a focaccia craving lately. I just haven’t gotten around to making any. I think I’ll have to get my yeast on this Sunday! Wow! I am tempted to try that. I haven’t worked much with wet dough so will count it as a major learning experience. Ooooo! 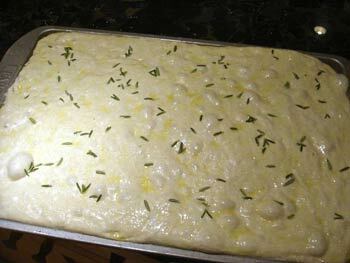 Finally another recipe for focaccia that I’m willing to try! I’m so glad you posted this. Beautiful, Susan! 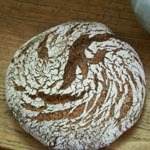 Another bread to add to my ever-growing list! Aw, come on now Susan! 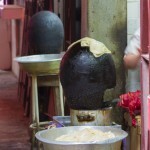 How can the San Fran bread queen venture east and not be pressed for a contribution? Of course you baked. I remember well when I first tasted grits after moving to the South – couldn’t believe people would actually eat them! Do you know that a true Southerner will pronounce “grits” as a two syllable word? Sort of like, New Orleans, as four syllables. I’m with you on the requests things. I like to bake what inspires me at that moment. Requests just annoy me. This looks great! I will love to try this! I absolutely adore Focaccia. I tried a recipe not too long ago and failed, MISERABLY! Do you have any advice for me on how to knead this dough? Unfortunately I don’t own a stand mixer!!! love Focaccia!!! it looks so delicious and fluffy! Made your focaccia today. loved,loved,loved!!!! It’s been along time from the last time I have a piece of focaccia 🙂 Wanna try it! Thank you for the great recipe!! Heh, had to read that twice. I’m thinking, “oh yeah, J. Grits, that avant-garde hip hop DJ…”. It looks delicious, Thanks for sharing the recipe. I will try to make it at this weekend. 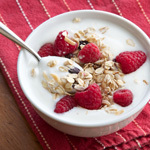 Maybe I will eat the breakfast.